Working to see the official welcome of women's ordination in the Roman Catholic Church. Look here for information about a variety of coming related events around the world. WOW activists will witness around the world outside of Cathedrals and churches exposing the exclusion of women from the priesthood. The World Day of Prayer is a concerted global action held annually on the feast of the Annunciation, to draw attention to women’s ordination into an inclusive and accountable Catholic Church. Every year, WOW members and women’s ordination activists around the world host events and prayer rituals to honor this special day. For anyone in Dublin on 8 February 2016! A presentation by Soline Humbert and Colm Holmes celebrating our 20th anniversary. The presentation will be followed by Q+A. Founded in Gmunden, Austria in 1996, Womens Ordination Worldwide is a network of organizations around the world working towards the ordination of women in the Roman Catholic Church. Please come and forward the invitation to your friends! This book is the fruit of 20 years of CWO's prayer, campaign, and comradeship. Myra and Pippa hope to see you there! Read on! 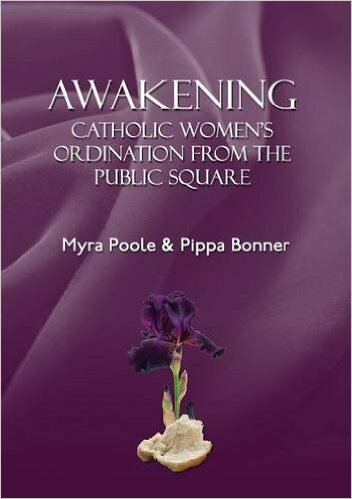 At the Piazza of Westminster on Vocations Sunday in 1994, a group representing CWO (Catholic Womens Ordination) gathered in quiet protest. Purple is the chosen colour of the organisation to denote mourning for the lost gifts of the women of the Roman Catholic Church and as a sign of the dignity of the royal priesthood of women, This liturgy of covering the door of Westminster Cathedral with apurple cloth and a purple iris was to cleanse the RC Church from its all male control. This was further emphasised during this liturgy by 7 minutes of silence to signify the exclusion of women from adminstering publicly all seven sacraments. Again, followed by going for a meal nearby for those who wish. This book is not like other books that have been written on this topic. We’re hoping it will stimulate fresh interest. We are urging members to set up discussion groups, with both CWO members and non-members and let us know people’s responses. There are discussion points at the end of each chapter. We also hope to arrange book launches and discussions in other parts of the country – e.g. Birmingham, South West and Wales, and any other part of the country that asks us. The book is based on over 20 years’ experience of bringing this topic to public notice and the hazards this entails. It is written in six chapters (152 pages) and does not need to be read chronologically. The Chapter headings speak for themselves as they open up different vistas on the root of the problem. The authors are committed to remaining within the Catholic Church, but recognise that women’s ministry, in its fullest inclusive sense, will only happen in a renewed Church. The book includes contributions from CWO members. It is written primarily for the general educated reader who is interested in a deeper understanding of this struggle and the important part it plays in highlighting the present theology on women, in the Catholic Church, that underpins the reasons for violence against women and their worldwide poverty. Chapter 2: Awakening from Loss towards Resilience. Chapter 3: Awakening to Spiritual Growth. Chapter 5: Awakening to ‘Symbolic Shifts’ in Feminist Theology. 'Lively, informative and accessibly written, it offers a resource to thoughtful Catholics seeking tools to rethink the renewal of the Church and women's transformed role and place within it.' Alana Harris, Teaching Fellow in Modern British History, King's College, London. 'I warmly commend this book to all who are engaged in current discussions about the role of women and men, clerical and lay, in the Church's mission to the world.' Una Kroll, author and formerly Church of England priest, now an urban solitary in life vows, dedicated to the sacred heart of Jesus. The 2014 Catholic Network for Women's Equality Retreat and Virtual AGM (WOW's member group from Canada)will take place on Saturday June 7, 2014 in various centres across Canada that will lead the retreat and log in to the National AGM via Webinar. Given Canada's vast geography, individuals unable to join a group will have the opportunity to participate by telephone. All CNWE members and friends are invited to participate! Watch Here for more details about this coming event in Rome. On May 22, 2014, a delegation of women’s ordination advocates from around the world will hold prayerful vigil at the Vatican marking John Paul II's attempt in his Apostolic Letter, Ordinatio Sacerdotalis, to silence discussion about women in priesthood. hand deliver letters to the Vatican from women who are called to the priesthood and from all those who stand up for justice in the church. Specifics of times and location to follow. The World Day of Prayer for Women's Ordination is a concerted global action held annually on March 25, the feast of the Annunciation, to draw attention to women's ordination into an inclusive and accountable Catholic Church. Every year women's ordination activists around the world host events to honor this special day. The Catholic Church Today: What Do Women Really Want? Father Tony Flannery embarks on a lecture tour of Ireland in January and February 2014. His topic: Church Reform. Wednesday, February 5th: South Court Hotel, Limerick: 8.00 pm.